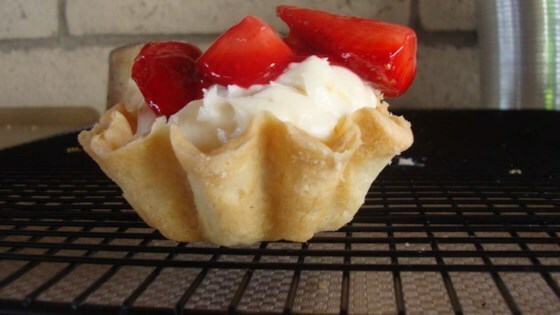 "Cream cheese adds a deliciously rich flavor to these tart shells." Blend cream cheese and butter or margarine. Stir in flour just until blended. Chill about 1 hour. This can be made ahead and chilled for up to 24 hours. Shape dough into 24 one-inch balls and press into ungreased 1 1/2 inch muffin cups (mini-muffin size) to make a shallow shell. Fill with your favorite filling and bake for 20 minutes, or until the crust is light brown.